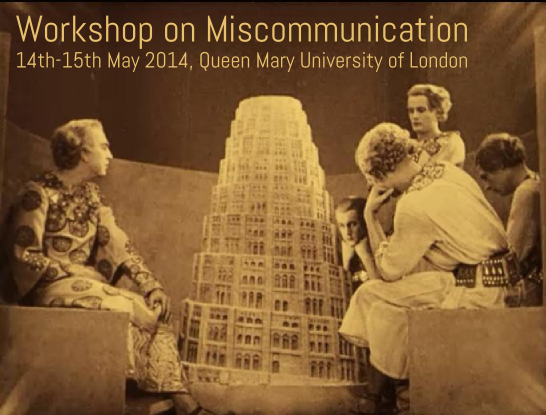 The 2014 International Workshop on Miscommunication follows two previous meetings at QMUL in 2006 and as part of the Cognitive Science conference in Stresa in 2005. The conceit of the workshop is that processes of detecting and dealing with miscommunication are key to explaining how communication is possible in principle and how it is effected in practice. The workshop will be held on Wednesday 14th and Thursday 15th May 2014 in room 3.20 of the Arts 2 building QMUL’s Mile End Campus (see this campus map) . The workshop will be free of charge, but limited to 50 people including speakers. Please contact us if you would like to attend and we will do our best to accommodate additional participants. Gregory Mills, University of Groningen, Faculty of Arts, Communication Dept.